“Riveting notes” link some of these photographs with contemporary text to help you express yourself. These litho printed cards are original creations of thoughts, pictures and even some recipes. But they’re not your mother’s “greeting cards”! 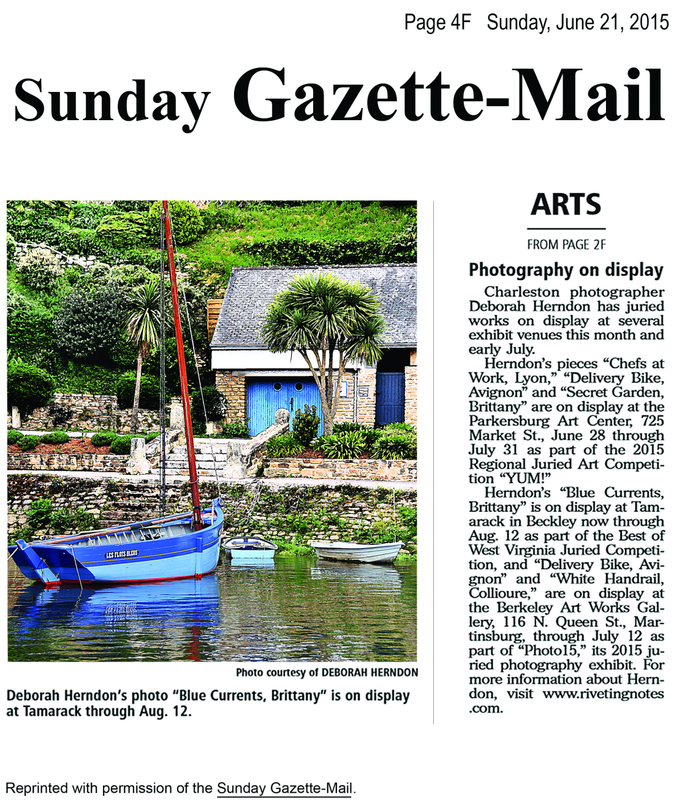 The Charleston Gazette-Mail; Arts & Letters: August 10, 2014 – Herndon Photographs. 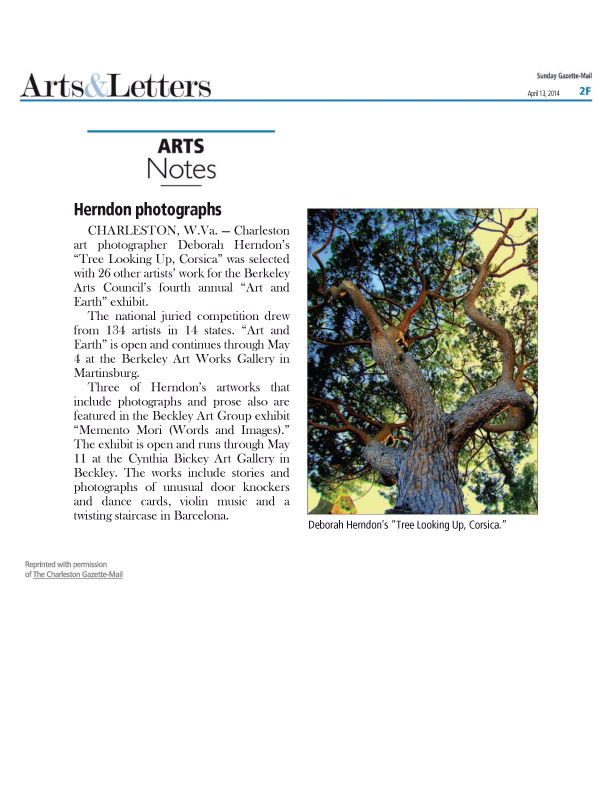 The Charleston Gazette-Mail; Arts & Letters: April 13, 2014 – Herndon Photographs. 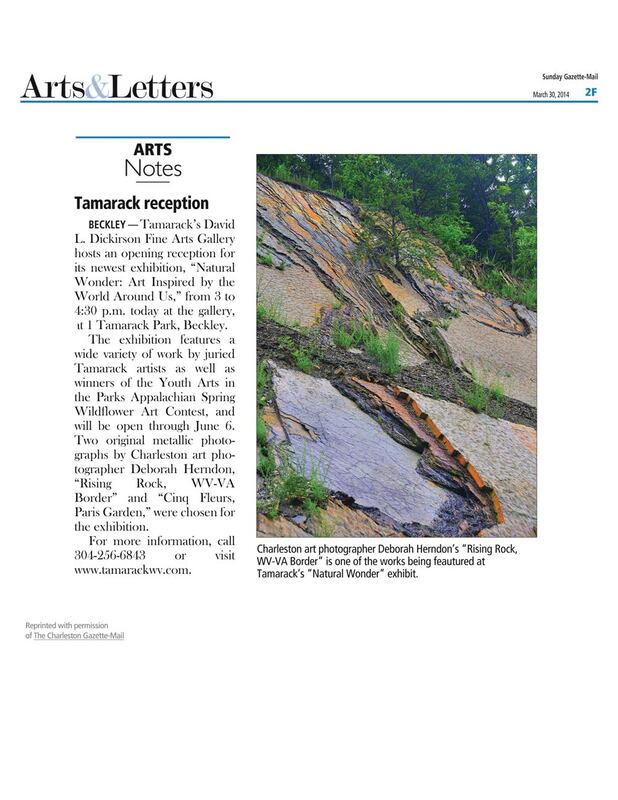 The Charleston Gazette-Mail; Arts & Letters: March 30, 2014 – ARTS Notes - Tamarack reception. The Charleston Gazette-Mail; Arts & Letters: February 9, 2014 – Herndon Photography Honored. 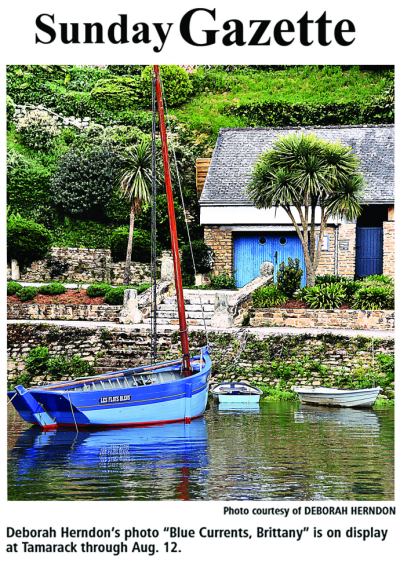 The Charleston Gazette-Mail; Arts & Letters: October 13, 2013 – Photographer solo exhibit. The Charleston Gazette-Mail; Arts & Letters: September 15, 2013 - Herndon Photography. 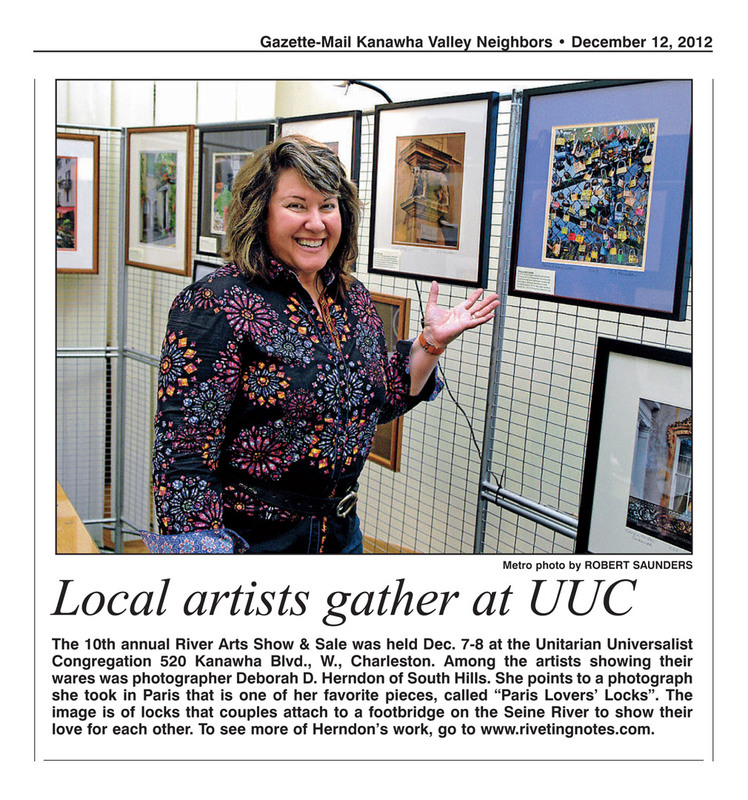 The Charleston Gazette; Local: March 5, 2013 - All roads lead to art. Arts&Letters: Feb. 24, 2013 - Local artist in Wheeling. Artworks Around Town in Wheeling: March 14, 2013 - Works of Herndon, Watkins to be featured. Arts&Letters: November 18, 2012 - Black Friday ArtWalk. Arts Notes: Feb. 5, 2012 - Artist and musicians. Review the article here. Art Notes: October 14, 2011 - Charleston artist in Chicago art show. Review the article here. 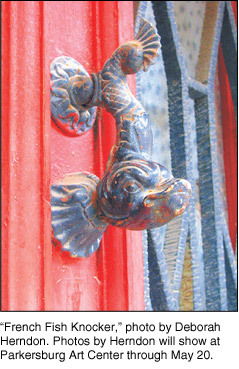 Art Notes: September 29, 2011 - Metallic photography exhibit to open Oct. 1. Review the article here. Art Notes: August 28, 2011 - Artist in Virginia Gallery. Review the article here. Art Notes: June 12, 2011 - Charleston Artist in Virginia. Review the article here. On-line magazine ("With a Southern Twist") founder and writer Wendy Shannon features article on Riveting Notes metallic prints and recipe cards. Please click on this link and enjoy! The Blue Céret Lock metallic photograph was selected for the "Best of West Virginia" Juried Exhibition opening June 13 - August 14, 2010 in Tamarack's Fine Arts Gallery in Beckley, WV. Further judging will occur for Best in Show and Distinction Awards. 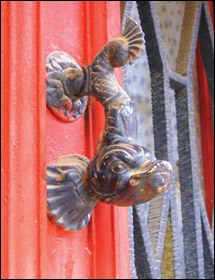 The French Fish Knocker metallic photograph is a Finalist of the 67th Allied Artists Juried Competition. It is on Exhibit at The Clay Center for Arts, Charleston, WV from May 1-June 27. Further judging will occur on May 21 for "Best in Show" and 8 Awards of Excellence. 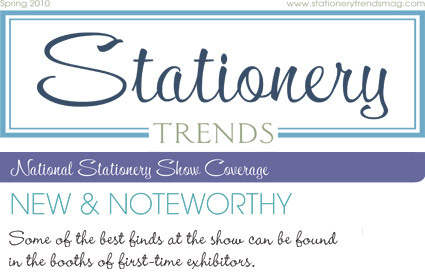 Click here to view the featured Riveting Notes card. 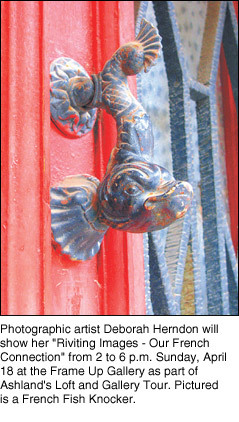 The Parkersburg Art Center has scheduled an exhibit of photographic art by Deborah Herndon of Charleston. The exhibit will feature enlarged metallic prints of artifacts and architectural details of ancient villages in southeastern France. Herndon said she will attend the exhibit opening to discuss the metallic print process and the “back story” of the photographs. The “Riveting Images — Our French Connection” exhibit opening is scheduled for 5:30 to 7:30 p.m. April 9 and continues through May 20. Admission is $5 for nonmembers and free to members of the Parkersburg Art Center. Reprinted with the permission of the The State Journal. ASHLAND -- As part of the Loft and Gallery Tour, the Frame Up Gallery will exhibit the photographic art from regional artist and Huntington native Deborah Herndon. The event will take place from 2 to 6 p.m. Sunday, April 18, in downtown Ashland. The exhibit, "Riveting Images -- Our French Connection," features enlarged metallic prints of artifacts and architectural details of ancient villages in southeast France. A unique metallic print process emboldens the color and depth of field of these limited edition images. Herndon will attend the exhibit to discuss the metallic print process and the origin of the photographs. 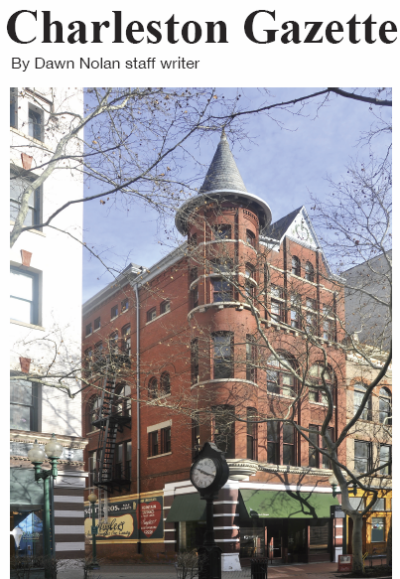 "Photography allows me to freeze frame an image that could be gone tomorrow," Herndon said. 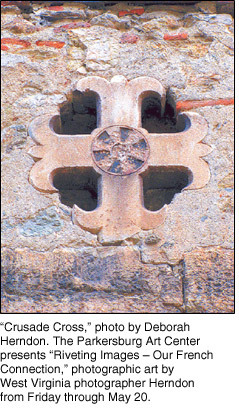 "Some of these artifacts are more than 500 years old and represent the cultural heritage of the Catalonian people. The Frame Up Gallery in historic Ashland's downtown is the perfect art venue to offer these metallic prints to those who like originality." Each metallic print comes with its own back story card that describes its origin. The limited edition works are also copyrighted and trademarked to protect future value. In addition to the metallic prints, Herndon has created cards to say "thank you -- with a recipe" that feature inviting French country doorways and recipes she developed from her travels there. "The hardest parts of creating a recipe are simplifying preparation and ensuring the result," she said. "I refined my recipes for many months before offering them to customers, but I enjoy the 'create and adapt' process." Twelve different images with 12 recipes are sold in the Frame Up Gallery, as well as other greeting cards designed by the photographer artist. Herndon's work has juried into Allied Artists of West Virginia, Tamarack, Alleghany Highlands Arts and Crafts Center in Virginia, and the Kentucky Guild of Artists. 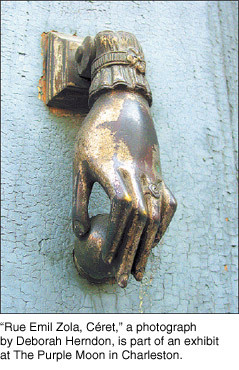 One of the metallic prints, French Fish Knocker, was recently accepted as a finalist in the 67th Allied Artists Competition to be exhibited May 1 to June 27 at The Clay Center in Charleston. The Frame Up Gallery exclusively offers these unique art prints and thank-you cards. In addition, the Huntington Museum of Art carries the Riveting Notes greeting cards. Reprinted with the permission of the The Herald-Dispatch. Charleston photographer, artist and “chefette” Deborah Herndon won first place at the Alleghany Highlands “Art of Chocolate Festival” in Clifton Forge, Va., for her Chessie Chocolate Pie. She was kind enough to share her recipe this week, along with an extra tip. 1. Combine all ingredients and cut together until sized like very coarse crumbs. Add 3-4 tablespoons ice water, 1 tablespoon at a time, until dough comes together. 2. Roll out dough on floured surface and place in 9-inch pie pan. Bake at 400 degrees for 6 minutes; set aside. 1. Combine all ingredients and pour filling into prepared pie shell. 2. Bake in a preheated 325-degree oven for about 55 minutes. 3. Let cool completely before cutting. Reprinted with the permission of the Charleston Daily Mail. PARKERSBURG – The Parkersburg Art Center presents “Riveting Images – Our French Connection,” photographic art by West Virginia photographer Deborah Herndon from Friday through May 20. The show features enlarged metallic prints of artifacts and architectural details of ancient villages in southeastern France. Herndon will attend the exhibit opening to discuss the metallic print process and the “back story” of the photographs 5:30 to 7:30 p.m. Friday. into Allied Artists, Tamarack, Alleghany Highlands Arts and Crafts Center in Virginia, and the Kentucky Guild of Artists. She also is exhibiting in Louisville, Ky., Bristol, Tenn., Staunton, Va., and Chicago galleries in April. Reprinted with the permission of the Sunday Gazette-Mail. Charleston photographer Deborah Herndon will be opening her first solo show, “Details,” at The Purple Moon on Thursday. 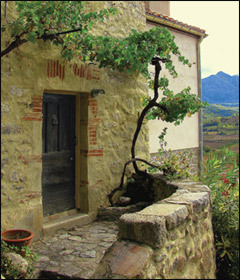 Herndon’s exhibit draws from photographs primarily taken in Southern France and examines the small details frequently overlooked. Deborah Herndon, a fourth-generation West Virginian, graduated from Marshall University and holds a doctorate from Pennsylvania State University and a J.D. from Saint Louis University. Her work has been judged into Allied Artists of West Virginia, Tamarack (Artisan Center) and the Allegheny Highlands Arts and Crafts Center in Virginia. “Details” opens with an artist’s reception from 5 to 8 p.m. Thursday. The Purple Moon, 906 Quarrier St. Special holiday hours: 11 a.m. to 6 p.m. Tuesday through Friday; 10 a.m. to 6 p.m. Saturday; 1 to 5 p.m. Sunday; 11 a.m. to 6 p.m. Dec. 21-23; 9 a.m. to 3 p.m. Dec. 24. The exhibit runs through Jan. 30. Attorney creates greeting card line to provide others a medium of expression. Artistic photography, simple words and intricate design all go into creating Deborah Herndon's Riveting Notes LLC, a company she started earlier this year. Herndon's cards range from serious sentiment, with photographs of international landscapes, to funny thoughts, with photographs of giraffe legs or rusty mailboxes. But Herndon did not always nurture her creative side. After some close family members began to have health problems, Herndon, who had worked as a successful litigator for almost 15 years, cut down on her law career to help care for family members. She then found herself more and more on the search for greeting cards and sympathy notes. She became discouraged. "I could never find the kind of card to purchase that said what I wanted it to say," she said. She saw a need for the perfect card and turned it into a creative business. "I've always enjoyed framing photographs, ever since grade school," Herndon said. Her photography skills have come a long way since grade school. Shooting photos nationally and internationally, Herndon uses still images, scenery and images of old hardware, pieces of windows and buildings and even her own granddaughter to create her notes. "I take photographs of things that interest me," she said. "It is usually small details. I look through them and see which one jumps out at me and gives me a thought." Although Herndon still tries to do some legal work on a part-time basis, she now focuses most of her energy on the new business. "It's a different kind of focus. It requires self-discipline. It's a real challenge, and I am using a different skill set -- one with less rules and more creativity," she said. Monika Hussell, the intellectual and property business counsel for Riveting Notes, was introduced to Herndon's photography and notes months ago. "The pictures she had taken were stunning," said Hussell, who has filed to register trademark and copyright for the cards. "The messages she joined with the pictures were creative and meaningful. Her intent was to capture in a card messages that were difficult for many of us to say." According to Hussell, Herndon has successfully done just that, capturing words of sentiment, encouragement, sympathy and joy. One of Herndon's favorite notes don the photo of some nails bent at an angle. "Steel bends where the heart begins," written on the inside, portrays Herndon's idea that "nothing is impossible if you have a good heart." One of the top sellers, "Rusty Mailbox," says, "It's been too long ... since we've connected," and it also is one of Herndon's favorites. Since establishing Riveting Notes this year, Herndon has started selling cards at The Purple Moon and The Clay Center in downtown Charleston, South Charleston Antique Mall, Cornucopia in South Hills, The Huntington Museum of Art in Huntington and at D'Accord Boutique in Shepherdstown. Herndon also distributes through several other stores in Virginia, Kentucky, Missouri and Illinois, including the Foundry Art Centre in St. Charles, Mo., Virginia Born and Bred in Lexington, Va., Blue Ribbon Boutique in Roanoke, Va., and the O. Winston Link Museum, also in Roanoke. "I'm honored to sell at these places. I'm grateful to all the people who have helped me," she said. Herndon also said she has taken her initial steps to win acceptance at Tamarack, the state-run arts center in Beckley. Herndon also has designed cards for the Episcopal diocese of West Virginia and a nonprofit organization -- the Education Alliance. "It's rewarding to see how quickly Deborah can take an artistic idea and turn it into a business success," Hussell said. "I'm thinking about some new lines of cards already, but it's important to sell what I have first," Herndon said. "This has been really great. I'm immersed in the creative side of my brain. It's very enjoyable in a different way." The greeting cards and information about Riveting Notes are available online at www.rivetingnotes.com.